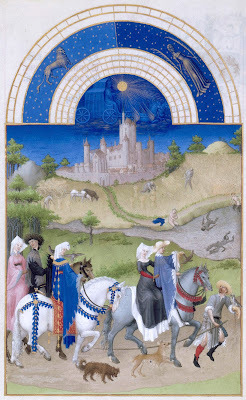 The month of August is named after the Roman Emperor, Augustus, and, whilst his image sometimes occurs in Medieval books of hours, it was not an image that any Roman would have recognised. Medieval artists depicted ancient figures, whether historical or mythological, with the clothes and attributes of their own time. The Emperor Augustus, portrayed as a Medieval monarch. 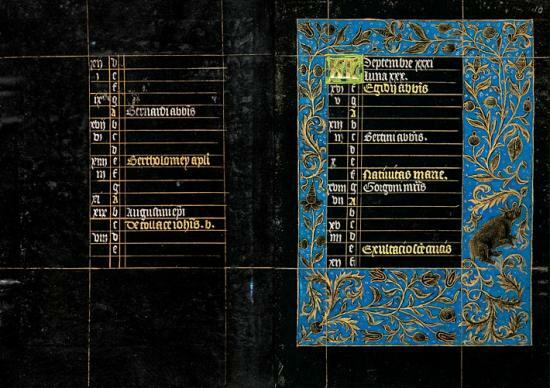 Bedford Hours, 1410-30, British Library Add. MS 18850 (image is in the Public Domain). 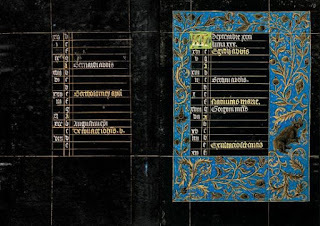 Calendar page for August, from the Black Hours, 1471-3, Morgan Library MS 493 (image is in the Public Domain). 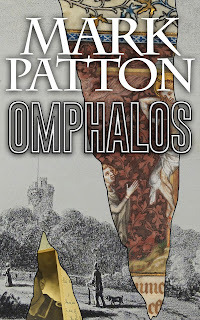 It was the month during which, for most Medieval European communities, the principle harvest of cereal crops was either safely gathered in or, failing that, a serious problem had to be confronted, typically through trade. Trading partners understood this, and could be expected to adjust their prices accordingly, so everything possible would be done to ensure a successful harvest. Some images show the harvest itself continuing into August, and this, of course, would depend upon the weather, and would vary between one region and another. 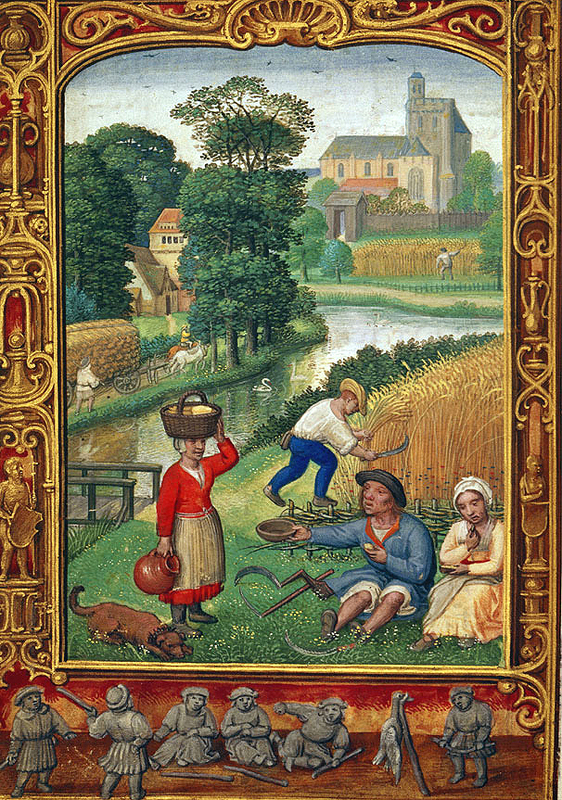 Image from the Golf Book, 1520-30, showing the harvest continuing in August. British Library, Add. MS. 24098, f 25v (image is in the Public Domain). 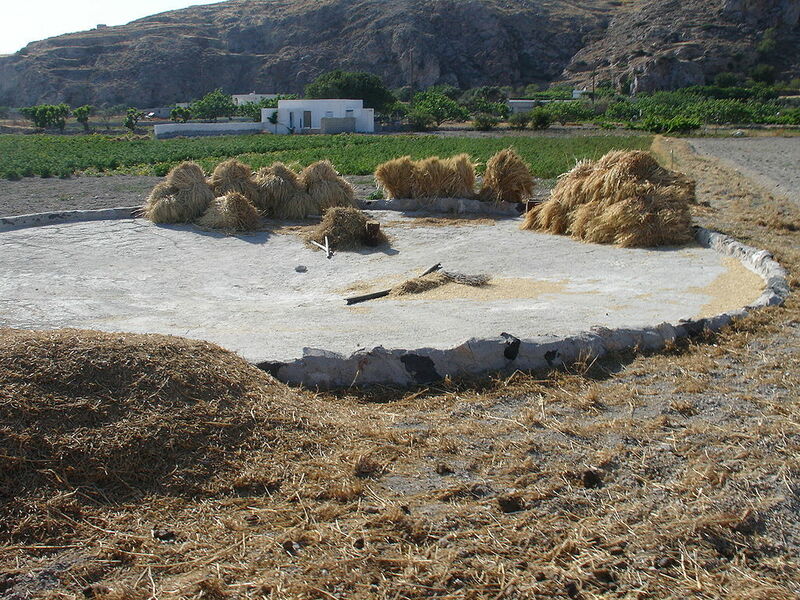 More commonly, however, the images for August show the processing of grain, specifically the processes of threshing and winnowing, and the storing of the grain in granaries. In the Mediterranean lands, threshing and winnowing would be undertaken on open-air stone threshing floors, the inedible husks broken either by hand, using a flail (a tool as old as agriculture itself, and carried as a symbol of power by Egyptian Pharaohs, to indicate their sacred role in ensuring the success of the annual harvest); or with a threshing sled, a wooden implement inset with sharp flint blades, dragged back and forth across the grain either by manpower or by beasts. 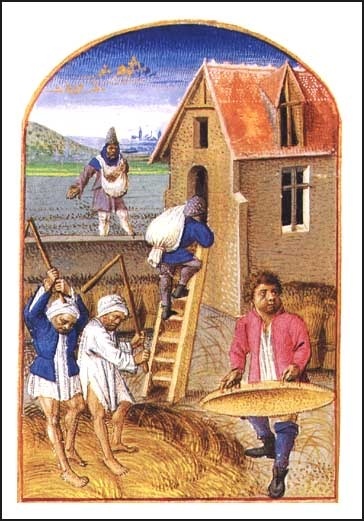 The crop would then be gathered up in winnowing baskets and thrown into the air: the winds carrying away the chaff; the edible grain falling back onto the threshing floor, from whence it could be gathered up into sacks to be stored, and, ultimately, taken to the miller to be turned into flour. 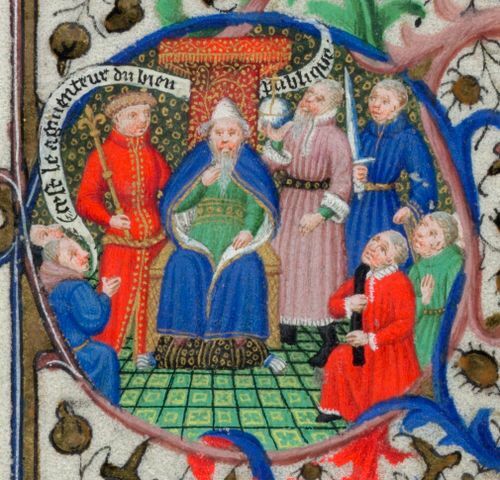 Image from the Bedford Hours, 1410-30, British Library Add. Ms. 18850 (image is in the Public Domain). 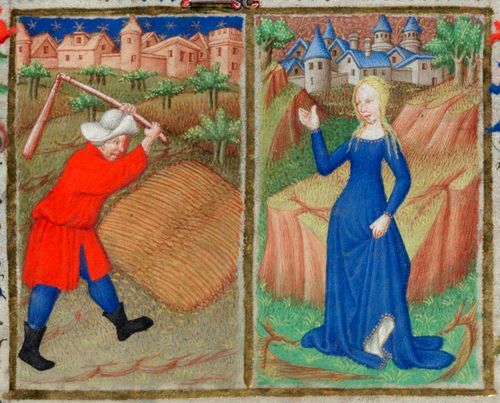 The man on the left threshes the grain with a flail, whilst the woman on the right, representing the astrological sign of Virgo, presides over the sacks of grain. 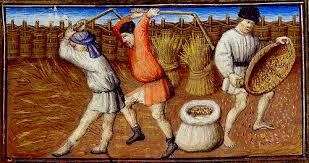 Threshing (with flails) and winnowing, 1500-25 (image is in the Public Domain). Threshing and winnowing, c 1460 (image is in the Public Domain). 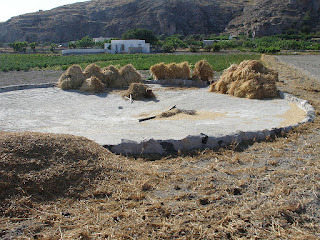 A modern threshing floor on Santorini, Greece. Photo: Stas Zvrek (licensed under GNU). 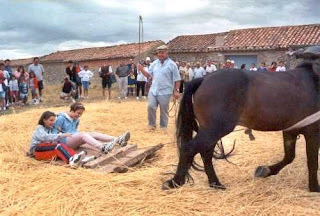 Threshing with a sled, near Valencia, Spain. 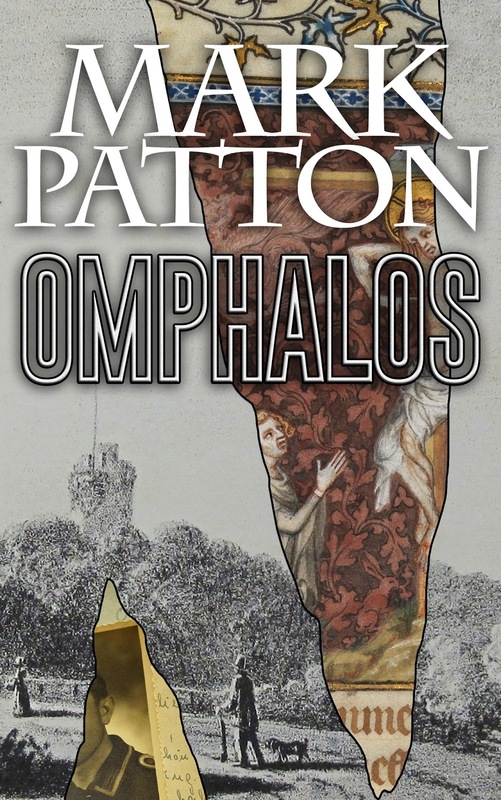 Photo: Pelayo 2 (licensed under GNU). Flint blades in a threshing sled. Photo: Jose-Manuel Benito (image is in the Public Domain). 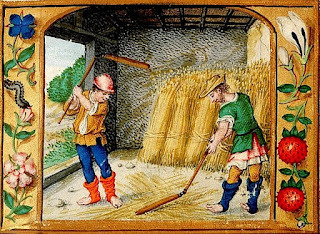 In northern Europe, where rainfall threatened the crop even at this late stage, threshing and winnowing were carried out indoors, in special barns with their long axes built at right angles to the prevailing wind. Opposed pairs of large doors ensured a through-draft of wind, allowing the grain and chaff to be separated in much the same way. 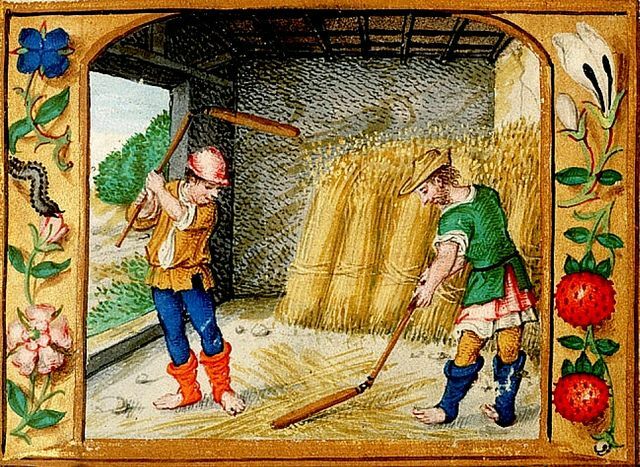 Threshing in a barn, 1500-25 (image is in the Public Domain). Tithe barn at Bradford-Upon-Avon, c 1340. Photo: RODW (image is in the Public Domain). The interior of the tithe barn at Bradford-Upon-Avon. Photo: Nessino (licensed under CCA). Not until all the grain was safely stored could people breathe a sigh of relief, and turn their attentions to celebration and recreation. Scene of falconry, from Les Tres Riches Heures du Duc de Berry, 1412-16, Musee Conde (image is in the Public Domain). The castle in the background is the Chateau d'Etampes.